Scorpions take sting out of pain. The University of Queensland has led an investigation into the venom composition of a wide range of previously unexplored scorpion species, finding compounds with tremendous potential for use in the discovery of new pain management medicines. Lead researcher Associate Professor Bryan Fry, from UQ's School of Biological Sciences, said Australia was well-known as the global hot-spot for all things venomous, but research into scorpion venom had been remarkably neglected. "Unlike some of their foreign counterparts, Australian scorpion stings rarely cause death, but their venom is an untapped resource for developing new pain medications," he said. "Our research has examined the full diversity of Australian scorpion venom for the first time. 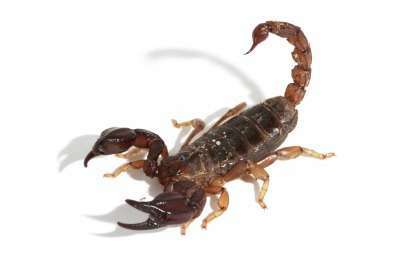 "Before this study, only one scorpion species had been studied in detail. "Now we have catalogued the chemical composition of the venoms of five more species which represent the three scorpion families. "The results radically shift our understanding as to how scorpion venoms have evolved." Understanding the evolution of scorpion venoms will allow researchers to identify important sequences which may be useful in treating human pain. "Some scorpion stings cause numbness, other cause tremendous pain," Associate Professor Fry said. "The compounds which cause numbness can be directly useful in treating pain, and the ones that cause pain can teach us a lot about how pain works and how we can reduce it." The researchers collected and milked hundreds of Australian scorpions, sequencing the venom and cataloguing all the compounds it contained. They constructed an evolutionary tree to group the venom compounds and provide a starting point for further studies. "We're going to select a number of sequences from each group and run them through a broad range of assays to see what they interact with," Associate Professor Fry said. "We've discovered a huge range of never-before-seen compounds, and among them we expect to find sequences of great interest for developing new pain treatments." The research was carried out by scientists from UQ's Venom Evolution Lab in the School of Biological Sciences; UQ's Institute for Molecular Bioscience; Dalhousie University, Canada; and Universidade do Porto, Portugal, and published in the journal Toxins on 13 December 2013.